I grew up playing soccer my whole life. When I started college, I missed the competitive environment of soccer so I needed something to fill the hole. One morning, I awoke to the sound of cowbells and cheering. As I wandered outside, I came to find out that IRONMAN Wisconsin was going on. I had heard of IRONMAN, but didn’t know much about it. Seeing all those people out there, pushing themselves beyond their limits truly inspired me. The next semester I signed up for a Triathlon Training class through the University. It was a 2-credit class, two days a week. At the end of the semester we did a class triathlon (olympic distance). Soon after I signed up for my first triathlon, I was hooked from there. After cheering at IRONMAN Wisconsin that year, I knew I had to sign up. The day after the race I waited in line to sign up. I may have been in over my head, but that’s okay! 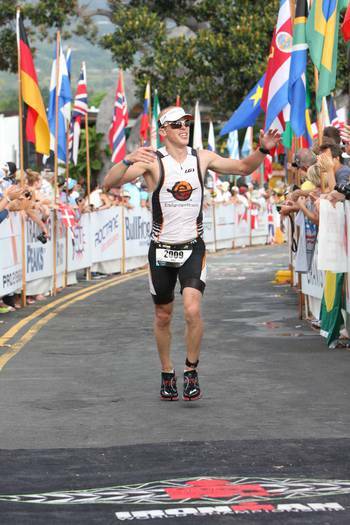 5 years later, I have just completed my first race at the IRONMAN World Championships in Kona, HI. A race I’ll never forget. I have a few favorite races over the years. The obvious choice is the IRONMAN World Championships in Kona. That was the most physically challenging race I’ve done in one of the most beautiful places. IRONMAN Wisconsin also has a special place in my heart, being my hometown. Hi! What’s Scarlet like to ride?? She’s my dream ride! Thanks for following my blog Eric! Look forward to following you along on your IM training journey as I prep for Ironman Tahoe! And to think, all I wanted to do was an iron man 70.3 in June 2014! Good luck with the next Iron Man, I hope you go sub 11 this time. I’m a swimmer at heart so getting up early on a Sunday to fit in a group bike ride is just not an attractive option for me. I’d like to go on my own but no idea how to go about it… any idea what sort of distance I should be aiming for on a solo ride? I really am a tri-newby! Thanks! I’d start by doing some 1-1.5 hour rides by yourself. Once you start to get comfortable with that time/distance of rides you can start throwing in a long distance ride each week or so. Increase the time or distance (peaking up to or around 60 miles if training for a 70.3 race). A lot of the time I like to bike alone, because then you can go the pace that is most comfortable for you. Groups can often slow you down or push you too hard. Hey Eric! I read your motivation post and agree with you. You’ve made significant progress in your race results too! You finished about a half hour before me in Madison 2011, awesome! Like you said, keep it fun! Hi Eric, great Blog! Thanks for following mine too. Thanks for stopping by Always On The Run. Yea, I shave my legs too.